This Home-Study Course is available as a PDF digital download at a reduced rate! To purchase the digital version, simply select it from the "Choose Format" pull-down menu before adding the product to your shopping cart. Our digital products allow you access to our online student learning center, where you will access your course materials, including your streaming DVDs, forms, manuals, and course exam. Click HERE to see a list of the required software to take our digital courses. It's all FREE! Don't need continuing education credits? If you do not wish to receive NSBTMB continuing education credits, you can choose the "no credit" version at a reduced rate! Simply select this version from your choice below. Once your order is processed and the manufacturer receives it, you will be sent an email with a user-name, password and directions for accessing our online "Student Central" website. At the site, you can take the multiple choice open-book exam online with instant results, submit your essays, watch the streaming videos (as often as you want), download and upload your enrollee, practicum and evaluation forms, print your transcripts and receive your certificates. Easy. There is nothing you need to snail-mail. All our courses are now totally electronic (online) so we can save the trees, gas, postage and lighten our "footprint". It's very easy to navigate, even for technophobes! We will send you the hard copy of the 200 page illustrated Sacred Stone Bodywork Manual and the two DVDs in the mail when you purchase the hard copy version of this course which is an option found at the bottom of this webpage. All homestudy students are asked to the exam online. (Reason for E-mail Address) Those who don't want to take the exam online can request a special hard copy version of the exam and course paper work be sent in the US mail for a $25 processing fee. Two Instructional DVD's (approximately 1 hour each). Unlimited tutorial assistance via email or phone. Students have one year to complete this course, but most students can do this in one month or less if they focus on it. We always allow extensions for extenuating circumstances. What Is Sacred Stone Therapy? "Therapy is only as good as the therapist"
Sacred Stone Therapy integrates heated and chilled sea stones into traditional massage therapy, based on ancient Ayurvedic principles. Warm, textured, velvety stones are laid under, around and on top of the client in the beginning, then, each part of the body receives traditional massage using warm, aromatic oils. Heated stones are glided along the muscles to iron out tension and provide a deep release. The texture of some stones can be gently exfoliating. Chilled stones are glided around the face, alternated with warm stones to create a rosy glow. Warm, flat, sea stones are laid upon the spine as the back of the legs are massaged. This can be used as an adjunct to deep tissue release or in energy healing, depending on the techniques chosen by the therapist. The techniques have been thoughtfully designed to bring the body, mind and soul back into balance and renew the sweetness of life in a world where people are driving while eating their lunch. 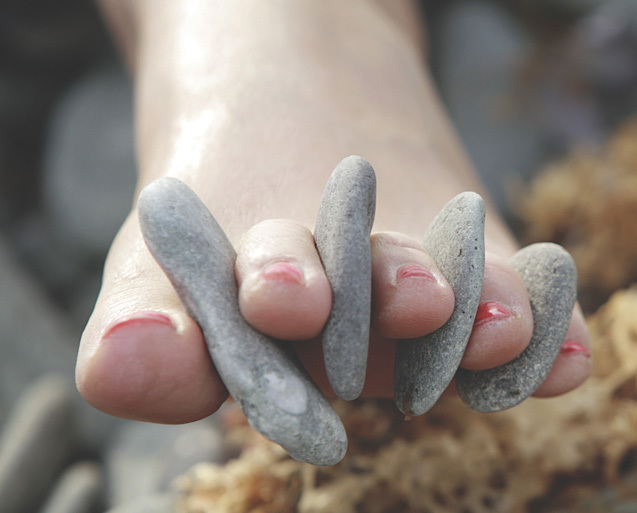 Sacred Stone Therapy is anxiety-reducing, nurturing, healing and restorative. Each session lasts about 75 minutes. Therapists can charge anywhere between $90-$150 for this therapy, depending on the socioeconomic status of the area, and the experience and credentials of the therapist. The manual has many detailed pictures and is very easy to understand. The "Classroom Demo" and "Concepts & Theory" DVDs are also very comprehensive and simple to follow. After you pass the course, you will be awarded your CE hours (transcripts) from the NCBTMB and a professional, beautiful wall certificate. Stones, Crystals, and Stone Heater sold seperately. 8. What part of the body should you execute the Touch Test? 9. What temperature should the water be in heating unit? 10. Generally, how long does it take for the heater to heat to a comfortable temperature? 11. What are the reasons for using chilled white quartzite stones?